A few weeks ago on a Friday night, my friends and I took the bus from Cusco to Puerto Maldonado. We were going on a jungle adventure for 2 days/1 night. 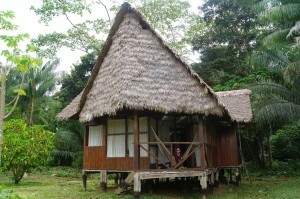 After approximately 10 hours the bus arrived in Puerto Maldonado and we took a taxi to the lodge. Upon arrival in the lodge, we enjoyed a lovely breakfast, spotted a sloth and rested for a while before heading towards the Tambopata River to take a boat ride of 1 hour to the lodge located in the jungle. We had lunch on the boat. I have to say, I was not prepared very well for an overnight in the jungle. I forgot my flashlight and my clothes were not very suitable for the Amazon climate. The climate is very humid. Fortunately, I did bring enough anti -repellent against the mosquitos. On our way to the cabin we saw a tarantula in her nest. To be honest, I am not a big fan of spiders but my guide told me that I should not be worried. This tarantula was going to stay in its nest or close to its nest for many more years. He assured me that I was not going to find the tarantula in my rain boots the next morning. After a little time of relaxing in the lodge and a well-prepared dinner, we boarded the boat again and went back on the river to go on a caiman search. We shared the boat with a group of people from Norway which was a lot of fun, they were really nice! We spotted several caimans and we even got to touch a baby caiman. Our guide got off the boat and caught one. Afterwards, he of course released it back in the water. We headed back towards the lodge, it was an interesting but very exhausting day and the next morning we had to get up at 4:00 am so I decided to go straight to bed. With the sounds of the jungle in the background I dozed off. 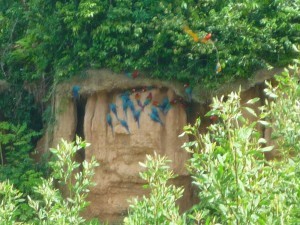 The next morning we woke up very early and around 4:30 am we began our journey to the Macaw Clay Lick “El Chuncho”. We observed all kinds of parrots and different species of macaws gather to eat clay. I never knew how loud these birds could be. From 6:00 am to about 10:00 am we watched this spectacle happen. We had to wait until one macaw was brave enough to make their way towards the wall, seconds later the rest would follow. We had a light breakfast on the riverbank and after this unforgettable experience we headed back towards the lodge. The boat ride took approximately 90 minutes and we were lucky to spot a lot of wildlife this day such as, turtles, monkeys, peccaries, birds and many more. We even saw a jaguar with its baby on the sandbank, only 40 meters away from the boat! Once we returned to the lodge we enjoyed breakfast, took a rest and enjoyed the facilities and surroundings of the lodge. The journey back to Cusco was scheduled at 5:00 pm so at 2:00 pm we had to make our way back to Puerto Maldonado. We had the luck that it had been raining and our truck that was going to transfer us back to Puerto Maldonado got stuck in the mud. Luckily, there were many men around to help and we made it on time to catch the bus back to Cusco. I had a great time! So far, this adventure has been my greatest trip in Peru. It leaves me with memories I will keep for the rest of my life.